This is going to be a really busy Geek-centric weekend, with Free Comic Book Day and Guardians of the Galaxy Vol. 2 both happening! 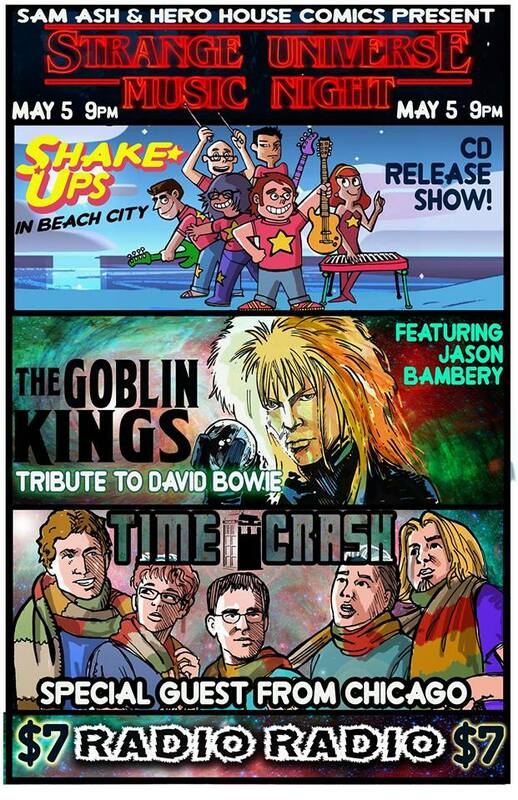 A great way to kick this weekend off, if you’re over the age of 21, will be to head over to Radio Radio in Fountain Square for a night of great Geeky music with The Shake Ups in Beach City, Goblin King, and Time Crash! That’s right, Friday night, from 9:00 PM to 12:20 AM, is Strange Universe Music Night at Radio Radio! First up on the list, we have The Shake Ups! Did you listen to Wednesday’s podcast interview with them? If not, do it now! I’ll wait! 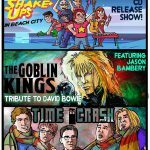 Seriously, though, the Shake Ups will be releasing their newest album, “The Shake Ups in Beach City”, which is based on the cartoon Steven Universe! The Shake Ups (Patrick, Savannah, Luisanna, Lee, Ed, and Steve) put on a great, high-energy, friendly show that’s full of clever songs and great music! Show your support for this local band, which was voted “Best Pop Band” by readers of Nuvo Magazine in their 2016 “Best of Indy” poll! Don’t forget to bring extra scratch for a CD and a shirt! Next on the list is The Goblin Kings! Featuring local guitarist, Jason Bambery (The Yavin 4, GNFN’R), this is a Labyrinth/David Bowie tribute act! I’m not able to find much information on this act, so I’m really looking forward to seeing what will be going on! I figure that an act that’s a Labyrinth and David Bowie tribute can’t be all bad! My friends, I don’t know much about music, or the local music scene, but I do know what I like, and what looks like a fun time, and this looks like a fun time! Tickets are only $7 for three bands, and I know Lizz and I are looking forward to it! Here’s the information you need to know, and I hope to see you all there! When is it? Friday, May 5th, 2017. Doors open at 8:00 PM, Music starts at 9:00 PM, and runs until 12:20 PM. How much is it? $7, and advance tickets are available on Radio Radio’s website!